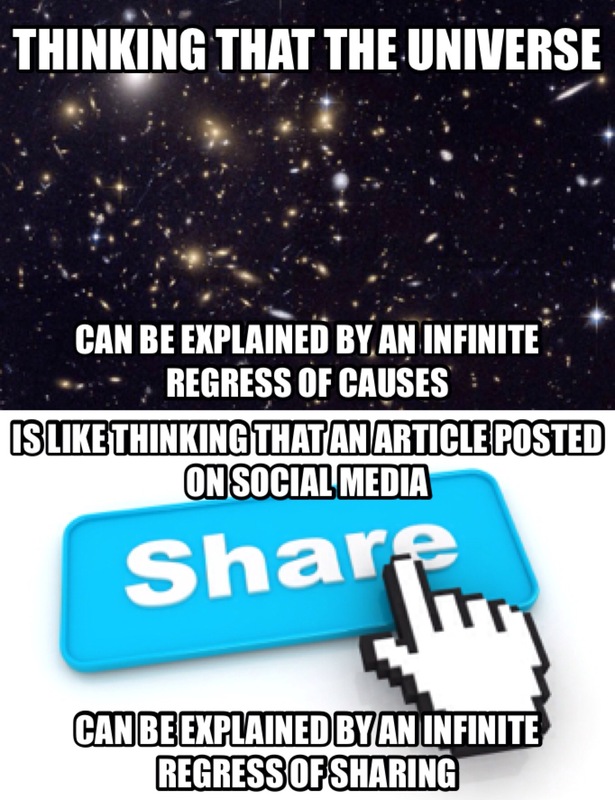 Think of “sharing” as a form of efficient causality that brings the potentiality of a posted article on one’s social media page into the actual shared article. Intuitively, we know that a proper explanation of an article is always going to include an author and/or original poster, who did not share the article from someone else’s page. That is, the existence of the article cannot be explained by some endless chain of sharing. Likewise, our contingent universe cannot be explained by an endless chain of efficient causers that “share” their actuality so as to change potential effects into actual effects. There must be an original author, an uncaused causer, and an unsharing poster. And when it comes to the universe, everyone calls this “God”.